Edward George Earle Lytton Bulwer-Lytton, 1st Baron Lytton PC (1803 1873), was an English novelist, poet, playwright, and politician. 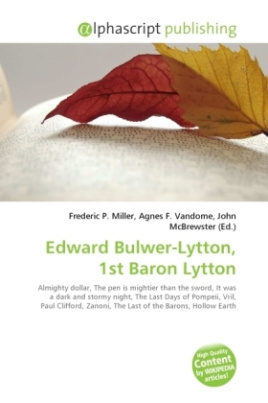 Bulwer-Lytton was a popular writer but his style now seems florid and embellished to modern tastes. He coined the phrases, "the great unwashed", "pursuit of the almighty dollar", "the pen is mightier than the sword", and the infamous opening line, "It was a dark and stormy night." He was the youngest son of General William Earle Bulwer of Heydon Hall and Wood Dalling, Norfolk and Elizabeth Barbara Lytton, daughter of Richard Warburton Lytton of Knebworth, Hertfordshire. He had two brothers, William Earle Lytton Bulwer (1799 1877) and Henry, later Lord Dalling and Bulwer. Bulwer-Lytton's original surname was Bulwer, the names 'Earle' and 'Lytton' were his middle names. On 20 February 1844 he assumed the name and arms of Lytton by royal licence and his surname then became 'Bulwer-Lytton'. His widowed mother had done the same in 1811. His brothers were always plain 'Bulwer'.